Best Auditorium Interior Designing Professionals, Contractors, Designer, Decorator in India. A fully air-conditioned Auditorium with a capacity of seating 200 people, ideal for seminars, conferences, functions, marriage parties, get-together, celebrations etc. Auditorium (WINTAGE)- THE WINGSTON offers you the pleasurable facility of an 81 seater auditorium. This area can be meticulously shaped up into a Conference Hall for Corporate Meetings. 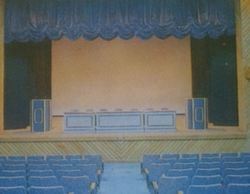 THE WINGSTON auditorium can also be used as a theater which will screen selected movies. Unique Automation systems - Auditoriums serve as an effective tool for communication through high–impact events, to ensure information about new developments is communicated effectively. These organizations benefit significantly from being able to present information to students and others impactful impression. Use: Auditorium Hall,Seminar Hall,Drama Hall.